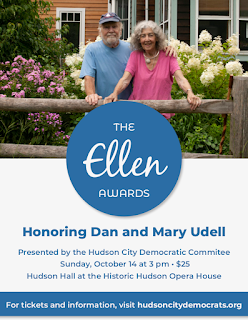 The Hudson Democrats' 3rd Annual Ellen Awards! The Hudson City Democratic Committee presents the third annual Ellen Awards ceremony with MC Fourth Ward Alderman Rich Volo. This year the award will be given to Dan and Mary Udell, who have, for at least fifteen years, filmed the meetings of Hudson’s Common Council, including committee and sub-committee meetings, and placed them on Mid-Hudson Cable for all to see. This has allowed a much wider public audience to see its city government at work. In addition to this remarkable service, for which they have received no remuneration, Dan and Mary have voluntarily taught videography classes in the Hudson schools, and have expanded their services to chronicling the meetings of the County Board of Supervisors, and to filming a number of community programs at the Hudson Area Library – COME AND CELEBRATE THE UDELLS and help us gear up for the midterm elections. Food & beverage provided! Tickets are $25, proceeds from which will support the work of the HCDC, including especially promoting our Democratic candidates, a number of whom will be joining in the festivities. Please join us! Stay up to date on the latest happenings and learn about upcoming events. We typically send 2 emails per month and you can unsubscribe at any time. With the goal of Progress for All, the Hudson City Democratic Committee builds grassroots support for policy initiatives and candidates. It is the official local body of the Democratic Party and works to ensure fair and transparent local elections. The county is divided into eighteen townships. Included within the county is one city, four incorporated villages and a number of villages and hamlets. Will You Be Away from Columbia County on Election Day?